UPDATE: Eton has now introduced the Grundig G5. This is the very same radio as the Eton E5. No one outside of the company knows what Eton’s marketing strategy is for this but for whatever reasons they have, Eton Corp has rebadged their Eton E5 as a Grundig G5. 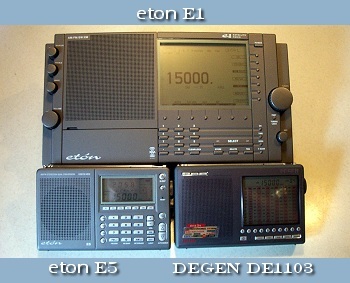 Both radios are currently available at the same price, but it is anyone’s guess as to whether or not the E5 will eventually be phased out in favor of the G5 or if they will continue to co-exist in Eton’s line. The only difference in the two radios (other than the name plate) is the color; the new G5 being a darker color than the E5. There are no electronic differences between the two sets. It is safe to buy either version based on price and availability. News of the arrival of the Eton E5 was of great interest to me. After all, I had read that the design is based on the Degen DE1103 / Kaito KA1103. These radios offer a level of performance versus price formerly unheard of in a travel-sized portable SW/AM/FM receiver. The Degen version costs about $65 delivered from China, while the Kaito version goes for around $110 here in the US. The Eton E5 is priced at $169.95 and is generally available for about $150. I ordered mine from Eton directly as they weren’t in stock at my favorite retailer…Eton themselves sell it for $150 so it would appear one would have to go out of their way to spend more for it. The E5 is a compact radio measuring about 6.6″ x 4.1″ x 1.1″ and weighing in at just over 12 oz. It is supplied with an AC adapter, carrying case, stereo ear buds, wire antenna and an Owner’s Manual in several languages. Although no batteries are supplied (it requires 4) AA’s) it will internally recharge NiMH cells. Unfortunately, the E5 does not contain “smart”charger circuitry; you have to dial in the correct charging time for the capacity of batteries you are using following a chart provided. Charging rate is somewhat slow compared with many of the rapid chargers available separately (11 hours for 1100 mAh cells and 23 hours for 2300 mAh cells) but you have the advantage of not having to constantly remove the batteries from the radio to charge them which is a plus. Some users have complained that the AC wall-art causes hum in their E5′s. I detected some hum while listening to weak AM stations but none on SW. It is possible the local environment (local interference, line noise etc) affects the results here, but in my location I would judge the AC Transformer to be slightly noisy. Eton has promised noise-free transformers to other owners who have contacted them but I have not read of their results with the replacements. At any rate, the noise will not be a problem if you only use the transformer to charge the batteries. 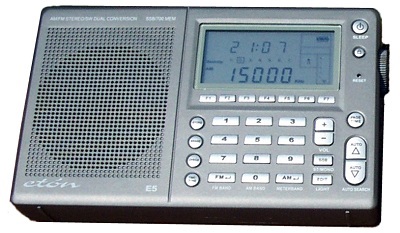 The E5 is a Dual Conversion design offering SSB reception with fine tuning via a thumbwheel. It offers 700 memories in 100 Pages with alpha-numeric tagging, ATS (Automatic Tuning Storage) of local FM frequencies, 24 hour clock with 4 alarms and sleep timer, auto-scan in two modes, FM Stereo at the Earphone and Line Out jacks, Local/DX switch, Wide/Narrow IF Selectivity (which also doubles as a Hi/Lo tone control for FM), and an External Antenna jack. Tuning is direct via a traditional keypad, Up/Down slewing buttons (9/10 KHz steps AM, 5 KHz SW, 100KHz FM), Auto Seek or a Tuning Knob (1KHz AM/SW, 25KHz FM). And of course the big news…there are dedicated Volume Up/Down buttons, eliminating the single biggest complaint of the DE1103/KA1103 which lack them. One could wish for dual speed tuning from the tuning knob…the 1KHz AM/SW steps render the knob most useful for fine tuning…band scanning is better accomplished using the Up/Down buttons with their larger steps. Thankfully there is no muting or chuffing when tuning via the knob. The E5 is now the second from the top of a line headed by the $500 E1, replacing the E10 which is now the third model down (generally retailing for around $130). Without a doubt the first thing I wanted to do when I got the E5 was to put it side-by-side with the DE1103 to see how identical or different they were. (See comparison pictures). Both by visual comparisons and use tests I can tell you that they are the same basic radio but the E5 offers a much improved software user interface. 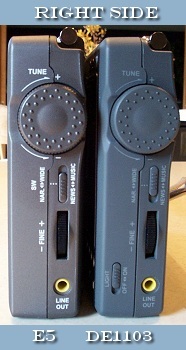 The cases are obviously from the same mold with the exception of the control layout. Gone is the large LCD analog-looking display of the 1103 radios, replaced by a keypad in standard format. Note also the “Light” switch has been eliminated from the side of the case; not much of an omission since it’s only purpose was to disable the illumination completely…the illumination options are otherwise identical. You can tap the Light Button for 15 seconds of illumination. Operating any of the controls also invokes 15 seconds of illumination, and on AC operation the illumination is always on.. Not only the LCD panel but all front panel controls are nicely illuminated for easy operation in the dark. The E5 adds the Volume Up/Down buttons mentioned earlier and a few buttons associated with the improved Memory System and Alpha Tagging capability. You can still punch in a volume setting numerically as on the 1103 if you wish, but the extra steps seem counter-intuitive in the presence of regular Volume Up/Down buttons. And one small but welcome improvement…the E5′s rod antenna now emerges slightly further out from the top of the cabinet, allowing it to sit vertically when the radio is on its tilt stand…something the1103 radios, as well as several other small Chinese radios cannot do; a small touch but one that is welcome if you sit the radio on a desk or shelf near a wall or on a windowsill. I ran several comparisons between two DE1103′s and the new E5 and I found they performed essentially identically with two exceptions. First, the E5 showed slightly superior FM selectivity. In my suburban location I am able to receive signals from many surrounding cities and the E5 consistently succeeded in separating some adjacent frequencies which interfered with each other on both of my DE1103′s. Second, the sound of the E5 is ever so slightly smoother on direct comparison with the DE1103. This may be a slight reduction in noise or a slightly less high end response, but the result is that the E5 sounds just slightly cleaner or smoother then the 1103. This is a subtle difference, only noticeable on a side-by-side comparison. To be fair, one of my 1103′s is from a very early batch, the other is about 1 year old and since Degen is in the habit of continually upgrading their products it is very possible that a brand new 1103 of recent manufacture might incorporate these improvements, but this is only speculation. In all other respects, basic RF and audio performance seemed identical – which is good news, as I have always been very impressed with the DE1103. And although I had learned to live with the DE1103′s peculiar volume control arrangement it is very obvious that adding Volume Up/Down buttons to the E5 has made it much more enjoyable to use. 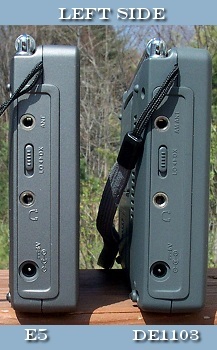 The external antenna socket (a typical 1/8″ mono mini jack) can be used to connect an external AM or SW antenna. Interestingly, Eton’s Owner’s Manual refers to this as an External “SW” jack with no mention of the fact that it also works for AM, and that doing so disconnects the internal ferrite rod AM antenna, which is the preferred mode of operation, and one which many portable radios do not offer. I successfully used the E5 (same is true of the DE1103) with several external AM & SW antennas with equally good results. After using the E5 for several days I am very impressed with this little radio. It is the most sensitive radio in this size I have ever tested (matched by the DE1103/KA1103 of course). I plugged in the supplied SW wire antenna and my reception improved noticeably. It gives a real boost to weak daytime SW signals…with it the E5 will pull in most of what’s available on any SW portable radio…yes it really is that good! I tuned in AFRTS and a few Hams and can verify that SSB performance was solid and stable. The Local /DX switch often improved things substantially in this mode. I have other more sophisticated radios which make tuning SSB a bit easier and allow more control over SSB reception, but for a small travel portable the E5 acquitted itself very nicely in SSB mode. Comparing it with my trusty Sony 7600GR, the E5 proved slightly more sensitive on AM & SW and noticeably more sensitive and selective on FM. But before anyone exaggerates this comparison let me put it into perspective. Tuning for extremely faint daytime AM and SW signals…ones which I could barely hear at all, there was just a SLIGHT superiority in the E5. For example, WWV on 15 MHz was coming in weakly one afternoon…it was just at the threshold of audibility where I could hear the tone reliably enough to set a clock by it. As this signal faded in and out of the noise, it remained a bit longer on the E5 than on the 7600GR. The difference was slight, but always in favor of the E5. Listening for the beeps which occur exactly on each minute there were several times I heard it on the E5 while the 7600GR had only hiss. As the signal faded in a bit more it became more equal on the two radios…so as signal levels rise a bit the two radios become closer. I then tuned some other SW stations which were coming in very weakly and there was always a slight superiority with the E5. The same was true on AM. Where noise accompanied some very weak AM signals, the E5 always rendered the stations with a slightly lower background noise level than the Sony. Not a huge difference, but it was there. I also must say I prefer the audio quality of the E5 over the Sony. The 7600GR has by comparison a slightly midrangy sound…somehow thin yet muffled in the highs. The E5 has more high frequency content in its audio which not only sounded more natural to me but also gives slightly greater intelligibility on voice and harmonic richness on music. Conversely, the Sony features a sync circuit which can sometimes reduce the effects of fading and can sometimes enhance adjacent channel selectivity substantially…that is still a strong point in favor of the Sony. Since the E5 did so well against the Sony I decided to put it up against my current favorite World Band portable radio, the Eton E1. This clearly was not a fair comparison. After all, the E1 retails for $500 and is simply loaded with features lacking on the E5. And not surprisingly, The E1 out pointed the E5 in all areas of operation except for one; raw RF sensitivity. Yes, it’s true. Tuning on AM or SW looking for extremely faint daytime signals the E5 (and also the Degen/Kaito 1103′s) are a hair more sensitive than the E1, primarily because a bit of synthesizer noise in the E1 limits its ultimate noise floor. Note: This does NOT mean you can hear more stations more clearly on the E5 than on the E1. The E1 simply has far better performance in other areas that in most cases more than compensates for its slightly inferior noise floor, such as superior selectivity, overload immunity, image rejection, its absolutely superb Synchronous Detection Circuitry, three IF bandwidths, rock stable SSB circuitry and much superior sound quality. On almost all signals the E1 will deliver a more pleasing listening experience. Yet it still a matter of amazement to me that in this one narrow area of performance, RF sensitivity, the E5 is so superb. That is why I said earlier that, in many ways, it sets the standard for radios in its size and price class. It also gives me high hopes that the forth-coming top of the line Degen, the long-awaited DE1108 will be a real “contender”, but that will be another story for another time. Many readers will be tempted to interpret this review as meaning that the E5 is the “best” world band radio in its price class. I generally prefer not to choose “best” radios, but rather to describe their strong and weak points so users can decide if a radio will suit their needs and preferences. So let me explain further. First of all, at $150, the E5 has some serious competition, even right in Eton’s own lineup. For example, the S350DL has just been reduced to $100 retail. The S-350 DL is more sensitive than the E5 and, as it is a much larger radio, also has a much bigger sound quality to it. For around the house the S350 is a very nice radio, but it’s a bit big for travel, lacks dual conversion to help eliminate images, and because it is an analog-tuned radio it offers no memories and has a bit of drift…it also does not have SSB capability. It is a different radio for a different purpose, so which one you prefer is largely determined by how you will use it. I would tend to use the S350DL around the house but I will grab the E5 for travel. It can also be argued that if the E5 is a great value, the DE1103 and KA1103 versions offer even more bang for the buck as they essentially match the E5′s performance at a lower cost but without some of the amenities of the E5. The choice is yours. So for now, the E5 has become my new traveling companion. It is solid, well made and pleasant to use and offers phenomenal performance in a small package. It is one hot radio in a compact size package and I recommend it heartily.